About Us | Swimming Pool Waterfalls by RicoRock®, Inc.
RicoRock® Inc. is the industry leader for pool rock and waterfalls in the U.S. We manufacture cast concrete rock used for waterfall and rock feature construction and sell wholesale thru Distributors to independent contractors throughout the U.S., Canada, and internationally. Radical innovations and patent pending designs have produced a waterfall construction method that is quickly changing the way pool waterfalls are built. RicoRock® was a division of Rock Formations Inc. until 2003. The Rock Formations name is now used by companies in CA, TX, FL, MN, LA, and SC but all are separate companies and not a part of RicoRock® Inc. Artificial rock has been around for at least 150 years and RicoRock® ’s roots go back over 30 years. RicoRock® started as a division of Rock Formations Inc., a company based in Orange County, California that specialized in artificial rock construction starting in 1979. Rock Formations Inc. pioneered many of the techniques and styles used to bring manmade rock into the residential swimming pool industry. We were recognized with numerous design awards from the National Pool Spa Institute, now the APSP, and were featured in several trade magazines and major newspapers.Rock Formations Inc. created a unique style of lagoon pool and built over 1,000 installations in a 25 year period. We occasionally provide project management for special projects but now we mostly supply product to a whole new generation of rock makers. 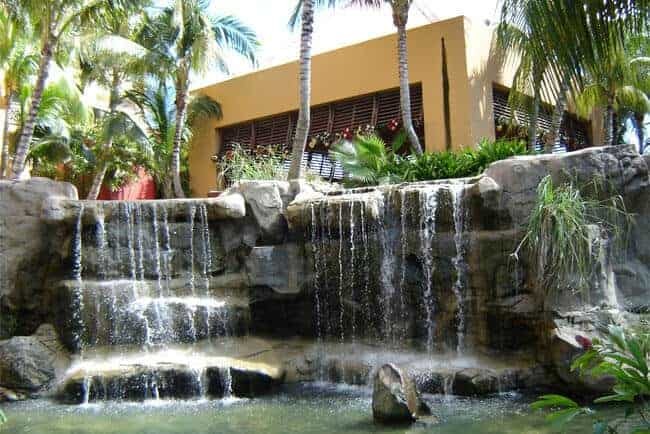 Rock Formations Inc also built commercial projects including the Raging Water Waterparks, Heritage USA in North Carolina, LeoFoo Village in Taiwan, Paradise Village in Mexico, the Radisson Aruba and small projects for Disney, Knotts and Six Flags. We even built a lagoon pool on a barge anchored near Cincinnati, Ohio. In 1999 we realized there was a huge demand for affordable pool rock features but we were building the same designs again and again as custom work that only affluent homeowners could afford and only highly skilled rock artisans could build. RicoRock® was simply a plan to create standard, affordable methods of rock construction. RicoRock® Inc. became an independent company in 2003. Since then we have successfully trained dozens of companies in the art of custom rock making and with the revolutionary simplicity of the Modular Waterfall system we now sell standard design product to hundreds of swimming pool related companies. RicoRock® Tech Support installs projects as prototypes, for training purposes or if a project is too complex for our dealers. RicoRock® has been featured on several home improvement TV programs and we are a member of the APSP and Florida Pool Association. Projects from our parent company that pioneered the use of artificial rocks on pools in the 1980’s and 90’s. All RicoRock® products are molded from natural rock formations. Our styles include limestone, sandstone, granite and quartz. Panels and boulders are available in all styles. Our Preferred Dealers have the most experience with our product and we approve of their workmanship. Click on the button to view our preferred dealers.